Some of the coolest polishes out there when I first got into nail polish were Nfu Ohs. They have had an awesome range of colorful flakies and holographic polishes for years now. I was always fascinated by their flakies, but it took me a few years to finally decide to crack down and get some. Nfu Oh 51 was quite a popular color, so I knew I had to get that first. 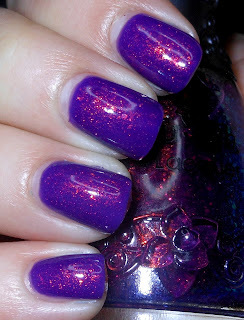 Nfu Oh 51 is a sheer purple base with with color shifting multchrome flakies. This color is often compared to Clarins 230, because of it's similarity in color and it's color shifting abilities.. You could use this on it's own, but it is better layered. I have to be honest I really was not wowed by this. In fact, this has been sitting in my swatch folder for months because I never felt inspired to post about it. The reason this didn't wow me is because I got it too late in the game. The Clarins 230 craze has been stifled by Max Factor Fantasy Fire and Girly Bits Shift Happens. I'm sure there are other indie polishes out there that replicate the whole Clarins 230 effect too. Also, the best flakies I've seen are right out of Cult Nails Unicorn Puke/Clairvoyant and Cult Nails Seduction. The flakies in the Nfu-Oh I found pretty weak. Meh, I've been completely spoiled by new polishes out there. This is certainly not a bad polish. It actually is very beautiful, and I would even recommend it especially if you do not have some of the other polishes I listed above. It really is a classic in the nail polish world. I just don't know if this measures up to some of the awesome polishes we have available to us currently. You can find this on FabulousStreet. This is just beautiful! I can't stop looking at it! This actually looks nothing like the one I own... Have you tried it over black? This is amazing... like there's a little fire in your nails. Gorgeous. Looks gorgeous!! I still have yet to try these polishes but sure I will at some point! Yes still was pretty meh. I wonder if maybe the switched the formula or I got a weird bottle? The flakies were not prominent at all. My bottle looks like it has more shimmer than flakies in it. I feel the same way. I have worn it twice and it just doesn't wow me. I wore it over OPI purple with a purpose and black. still just meh. I have heard that the ingredients used for Nfu Oh bottles aren't as strong as they used to be - same goes for the holo's. Not sure how much of that is true but when I see this I do believe it isn't the original formula! WOW! I've always done this polish over dark blues and didn't love it but the LA Girl polish you used makes this really look fantastic!! I know what you mean about the polish though, since this type of pigment is more readily available now it's almost less special. I actually prefer this on its own rather than layered — at least, that's how I like it on me! (Although I have to say that I think it looks really good in your photos, too.) I feel like at three coats, it's right up there with Cult Clairvoyant in terms of awesomeness.